Enrich your Wright Plus experience with an engaging panel discussion of the recent restoration of Wright’s iconic Robie House. Following the program, experience and explore the restored Robie House for yourself at an exclusive cocktail reception. Completed in 1910, the Robie House is celebrated as one of the defining buildings of Frank Lloyd Wright’s career. Spring 2019 marks a critical moment in the history of this remarkable building as the Trust completes interior restoration of the major rooms of the house. Restored wall and ceiling plaster and vibrant original coloration have transformed the interiors, and the reinstallation of historic lighting and leaded glass windows illuminate the space as Wright originally intended. Join preservation architects Gunny Harboe of Harboe Architects and Karen Sweeney of the Frank Lloyd Wright Trust, and Tim Samuelson, Cultural Historian for the City of Chicago, as they discuss the restoration of Wright’s iconic Robie House. The discussion will be moderated by Trust Curator, David Bagnall. Immediately following the panel discussion, visit Robie House for a private reception of this restored Prairie masterpiece. Karen Sweeney and Trust Curator David Bagnall will be on hand to answer questions about this important restoration. Gunny Harboe, FAIA's firm, Harboe Architects led the restoration of Robie House. Over the last 25 years, he has restored some of the Chicago area's most cherished landmarks including Unity Temple, The Rookery, Reliance Building (now the Hotel Burnham), and Carson Pirie Scott (now the Sullivan Center). His current projects include several Frank Lloyd Wright-designed sites, including Robie House and Taliesin West. Karen A. Sweeney, AIA is Preservation Architect and Facilities Director for the Frank Lloyd Wright Trust. Ms. Sweeney is project manager for the restoration work underway at Robie House. 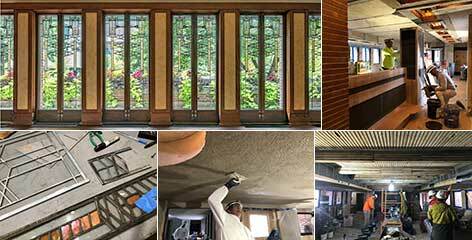 Her ongoing work includes overseeing preservation efforts at the Frank Lloyd Wright Home and Studio. On staff since 1987, she previously co-chaired the Frank Lloyd Wright Home and Studio Restoration Committee. Tim Samuelson has served as the City of Chicago’s official Cultural Historian since 2002. He was previously the Curator of Architecture & Design at the Chicago History Museum, has served as a preservation specialist for the Commission on Chicago Landmarks, and is a contributor to numerous cultural publications. Cocktail Reception at the Robie House. Don't miss Renewing Wright's Vision during Wright Plus weekend.